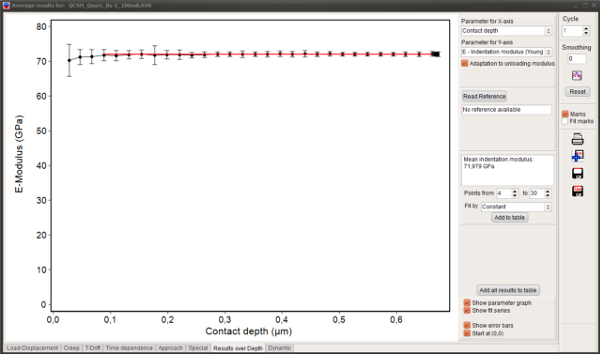 ASMEC is the developer of the control and analysis software InspectorX for the nanoindenters of ASMEC and ZwickRoell. 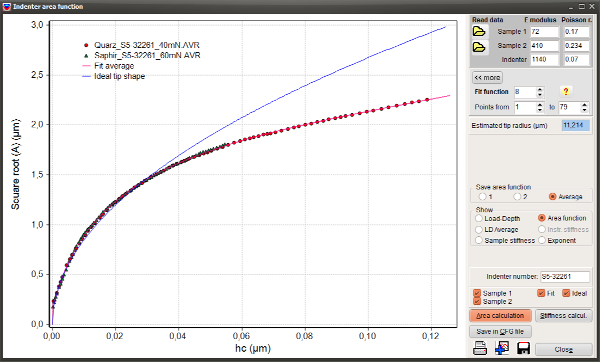 Further, the instrument independent programs Elastica® and IndentAnalyser® are developed and sold by ASMEC. After registration as customer the complete software and the newest updates can be downloaded in the customer area (login necessary). Investigation of elastic stresses, strains and deformations in coated surfaces during mechanical load and impact (normal and lateral). 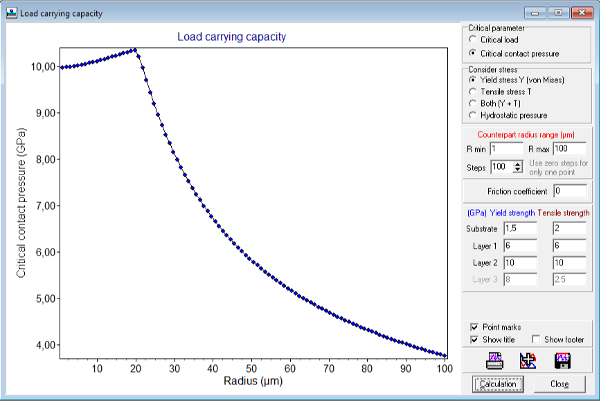 Investigation of the load carrying capacity of surfaces. Optimization of coatings for mechanical protection and support of the coating design. 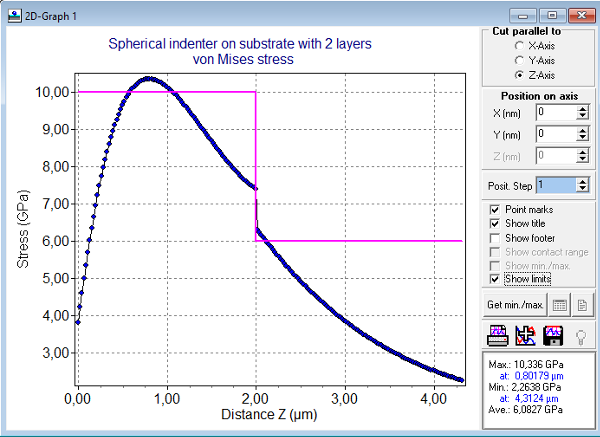 Analysis of indentation, scratch and wear tests and support for the design of such experiments. The calculation is about 1000 times faster due to the use of complete analytical solutions. This enables a real multi−parameter search and optimization. Sharp stress peaks and the position and dimension of the contact area are well resolved. Up to three layers on a substrate with thicknesses between some nanometer and several meters can be considered without redesign of the contact geometry. Calculations of non−rotational symmetric contact problems, caused by tangential forces in one direction, can be done with the same calculation speed. In many cases deviations from these assumptions are not that restrictive as first suspected. Despite all idealizations the model delivers in most cases feasible results. If you are not sure whether you can examine your contact problem with Elastica, please contact us. After installation this software is only working as trial version with limited rights. You have the option to test the software as full version for a period of 30 days. You only need to click on our email address in the Welcome window and to add the missing data in the prepared email. After purchasing the software you will get an access code for an unlimited period. Simultaneous reading, presentation and analysis of up to several hundred indentation measurements. Analysis of indentation modulus, indentation hardness, Martens hardness, equivalent Vickers hardness, indentation creep, energies according to DIN EN ISO 14577 and more than 60 additional parameters. Zero point correction automatic or manual. Thermal drift correction automatic or manual. Radial displacement correction and variable epsilon factor. Averaging of measurements with equal load and equal sequence, even for different number of data points. Determination and application of indenter area function or radius function (for spherical tips) with maximum two reference materials. Analysis or purely elastic measurements with spherical tips and complete elimination of the substrate influence for the calculation of the Young’s modulus. T herefore this module can be applied to measurements of ultra−thin and hard coatings of only 20nm or less. Modeling of force−displacement curves (loading and unloading) after specification of force, indentation hardness and modulus, also under consideration of the real area function. 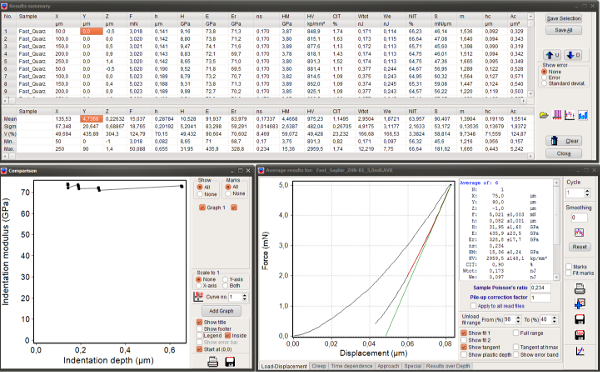 Analysis of lateral force−displacement measurements (only UNAT and ZHN) for example in scratch or wear tests. 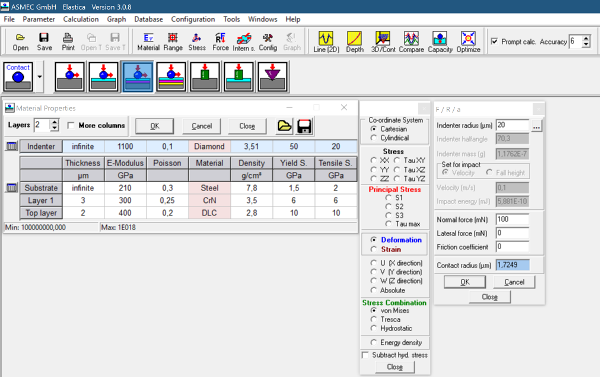 Materials database with parameters like E−modulus, Poisson’s ratio, density, yield strength, thermal expansion and other for about 630 materials. To analyze the data it is necessary for most of the instruments to convert them in text format. 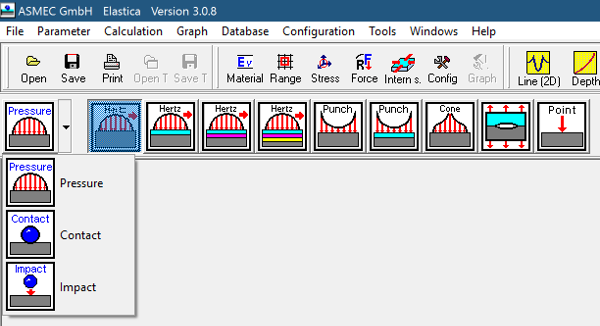 This can be done with the export function of the original software. This is done through the respective export routines. The user manual gives some hints. Further data from different non−commercial research instruments can be read.